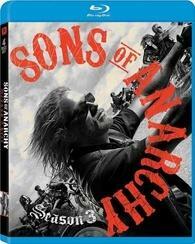 SAMCRO will motor on to Ireland in their third season for Blu-ray this August. In an early announcement to retailers, 20th Century Fox is working on 'Sons of Anarchy: Season Three' starring Ron Perlman, Katey Sagal, and Charlie Hunnam for Blu-ray on August 30. The 3-disc set will contain all 13 episodes with 1080p video, a DTS-HD Master Audio soundtrack, and supplements will include: Episode Commentary on "SO" featuring Kurt Sutter, Dave Erickson, Chris Collins, Regina Corrado, Katey Sagal and Marco Ramirez; Episode Commentary on "Firinne" featuring Kurt Sutter, Charlie Hunnam, Katey Sagal and Maggie Siff; Episode Commentary on "NS" featuring Kurt Sutter, Charlie Hunnam, Ron Perlman, Mark Boone Jr., Kim Coates, Tommy Flanagn, Theo Rossi and Dayton Callie; "Bainne" (Extended Episode); "June Wedding" (Extended Episode); Season 3 Bridge Pieces; Writers Roundtable; Bike Customizer; Directing the Finale with Kurt Sutter; "NS" Table read with Cast; Gag Reel; Deleted/Extended Scenes; and Fox Movie Channel Presents World Premiere: Sons of Anarchy Season 3. Suggested list price for the Blu-ray set is $69.99. You can find the latest specs for 'Sons of Anarchy: Season Three' linked from our Blu-ray Release Schedule, where it is indexed under August 30.